As Arctic Ice Melts, It's A Free-For-All For Oil ... And Tusks The melting of ice in the northern latitudes is feeding new industries. Among them: speculating for petroleum products where vast amounts of undiscovered oil and natural gas are believed to be, and hunting for mammoth tusks unearthed in the softening tundra. It's widely known that the world's icecaps are melting. While most people are focused on what we're losing, some have considered what might be gained by the disappearance of all that ice. In 2008, the U.S. Geological Survey released a report estimating that 13 percent of the world's remaining undiscovered oil and 30 percent of the remaining undiscovered natural gas could be in the Arctic. Amy Crawford, writing in this month's Smithsonian Magazine, says that Russia has already sent submarines deep into the Arctic Ocean to look for that oil and natural gas, and that China, too, wants a piece of the action. "China obviously does not have any Arctic coastline," Crawford tells Weekends on All Things Considered host Jacki Lyden. "Their northern border is about 900 miles from the Arctic Circle. But they are seeking influence." That influence would come through Canada, one of their chief providers of oil. But so far, Russia has the upper hand. 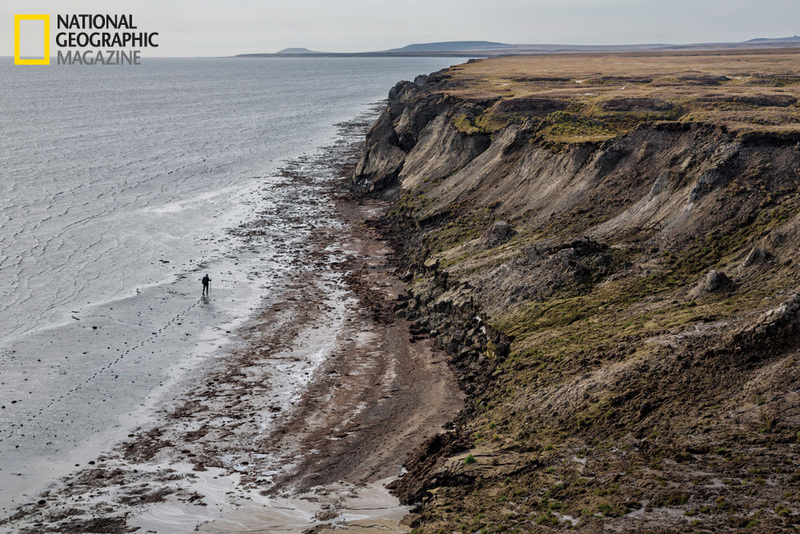 A tusk hunter scours the coast of Bolshoy Lyakhovsky Island in northern Russia. Lured by rising prices for mammoth ivory, hundreds of men cross the frozen Arctic seas each spring to search for it along eroding shorelines. "Russia is hoping that the U.N. will recognize its claim to a very large swath of territory right up to the North Pole itself," Crawford says. "So in 2007, they actually did this symbolic flag planting where they sent a formerly secret mini submarine down [to the seafloor] ... and they planted a titanium flag. So it sounds like something out of Christopher Columbus' playbook." But petroleum products aren't the only commodities appearing where Arctic ice once was. In Siberia, the tusks of long-dead mammoths, which have been encased in ice for centuries, are now becoming exposed. That's bringing along tusk hunters and ivory poachers. "After the international ban of elephant ivory trade in 1991, mammoth tusk became sort of a substitute for [elephant ivory]," says photographer Evgenia Arbugaeva who grew up in a town in Siberia and heard about the rush of local men selling mammoth ivory. "So I would say from 1991, people really started to see it as a business." There are millions of tusks out in the tundra. Many of them are buried very deep in the ice, but some are near the surface, and that's where local hunters are finding them. 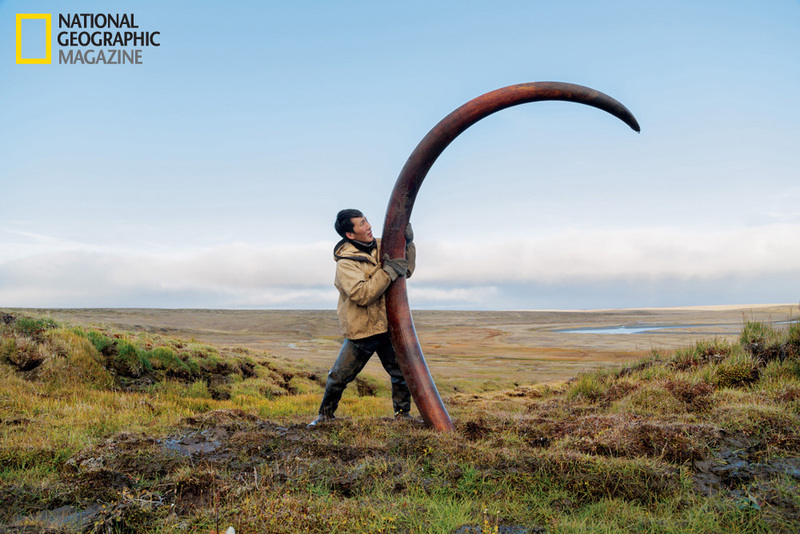 So Abrugaeva and writer Brook Larmer traveled to remote Yakutia, Russia, for a story about mammoth tusk hunting published in the April issue of National Geographic Magazine. Larmer says that 90 percent of mammoth tusks end up in China, where they are often turned into mammoth trinkets. But the bigger tusks can be carved by master carvers in southern China and turned into art that can be worth $1 million or $1.5 million. But the tusks aren't as plentiful as you might imagine. "[Tusk hunters] can go a whole summer and find only a couple hundred pounds worth of tusk, but those tusks are so valuable," Larmer says. The tusk seen in the image below? Larmer says it's "probably the finest specimen that was found last year. And that can be worth $80,000 to $100,000 or even more," when the hunters sell them in Yakutia. After being frozen for thousands of years in a Siberian riverbed, this pristine mammoth tusk is a financial boon to the hunter who found it. But how do scientists feel about the tusk hunters, who could be seen as disturbing scientific data by taking the tusks away? Larmer says some scientists lament the tusk hunting and trade. "Each of these tusks is kind of like a tree, which has rings," he says. "The tusks themselves can kind of carry information about the climate, the diet — that would be valuable data. 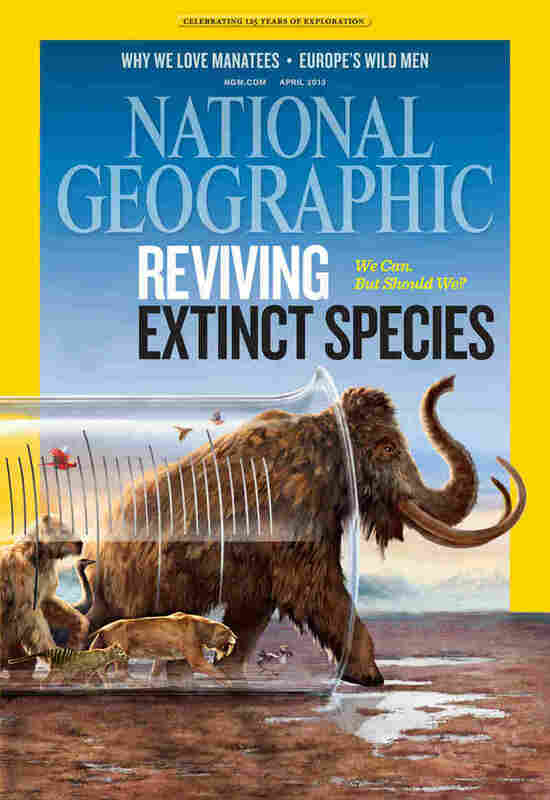 On the other hand, if they find mammoth hair, or an intact mammoth, they're the first ones that tell the scientists."